What is a 'self-reliant diver'? This is a diver that is not relying on their buddy for assistance with problems or adjustments; this is diver that has reduntant systems, a diver that can handle most situations by themself. While most self-reliant divers still dive with a buddy, that buddy is just there for the sheer pleasure of diving together. 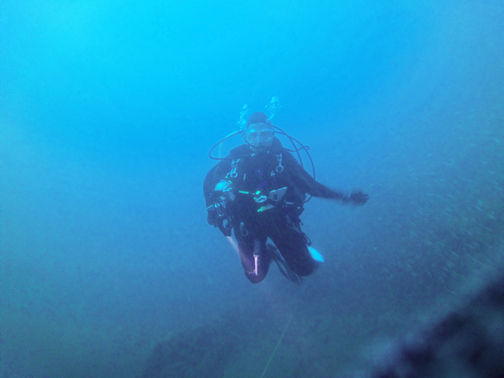 While this course is not for everyone, it is a great way to feel more secure while diving, even when you are diving with more then just yourself. If you decide you want to go on that 'solo' dive, then this course is a must for you. You will find that pre-dive planning is extra important for a solo diver. Making sure someone knows where you are and what time you plan on being back. You will need to demonstrate good planning skills as well as proper judgment. What are the limits based on your personal gas consumption, equipment configurations and redundancies. Learn, practice and demonstrate emergency change overs to back up regulators and bailouts. All participants must be able to do a surface swim of no less then 200 meters/600 feet in full equipment without stopping. To purchase this product, contact us at at the store.